Rock group Genesis release their 1st record “Silent Sun”. 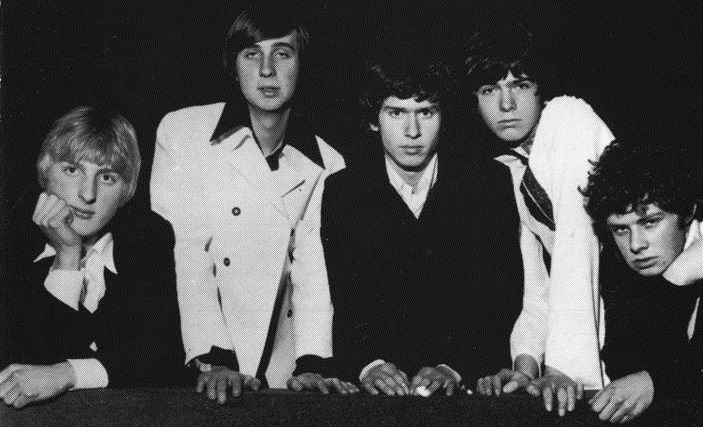 Genesis in 1967 with Anthony Phillips, Mike Rutherford, Tony Banks, Peter Gabriel and Chris Stewart. Source: Wikipedia. Click to enlarge. In their early years, Genesis’s music was initially regarded as a “pop experiment”, as evident by their debut album From Genesis to Revelation (1969). Following numerous line-up changes, they evolved into aprogressive rock band with Trespass (1970) and Nursery Cryme (1971), which showcased longer tracks, fantasy lyrics, and complex song structures and instrumentation. Their success continued with Foxtrot(1972), which features the 23-minute track “Supper’s Ready“, and Selling England by the Pound (1973). Genesis concerts during this time became theatrical experiences with stage design, pyrotechnics, story telling, and Gabriel wearing make-up and costumes. In 1975, after touring in support of their doubleconcept album The Lamb Lies Down on Broadway (1974), Gabriel left the band. Collins would handle drums and lead vocals on their subsequent studio albums, of which three more were released in the 1970s:A Trick of the Tail (1976), Wind & Wuthering (1976), and …And Then There Were Three… (1978). The single “Follow You Follow Me” from the latter was a major international success and represented a change in their musical direction, becoming more pop-oriented and commercially accessible. You are currently reading On This Day: February 22 at IvyU.